We are less than two months away from the beginning of the NFL season and draft season is picking up steam. With that in mind, we bring you the first installment of the Fantasy Football ADP Report. We will be updating ADP information and pointing out any trends and changes throughout the summer to get you ready for the upcoming Fantasy Football season. Before I go into the data, I must release my disclaimer about how ADP data is largely subjective and can vary greatly depending on the source one uses. If you’re going to rely on ADP, I would suggest using multiple sources to try to get a more accurate picture of how the fantasy community at large values a particular player. A lot of Fantasy Football ADP data is also skewed because it does not differentiate between leagues that may have characteristics which would affect a player’s potential value. League sizes, roster parameters, scoring system, and other factors are often excluded from raw ADP data. Fantasy Football ADP should not be relied upon as the end-all be-all of player evaluation. It should merely be a tool used, not the entire basis of evaluations. Now that I’ve said my little monologue about ADP, let’s get into some observations on early ADP trends. The first round is chock full of running backs this year. Here at Fantrax, nine of the first 12 picks are running backs, including the top four picks. This is interesting because in recent years the trend has been to avoid putting too much draft equity on running backs because of their perceived injury and bust risk. However, we need to look no further than last year to see that players at all positions are susceptible to injury and/or poor performance. Odell Beckham and Mike Evans were both selected in the first round of most drafts last year, and Jordy Nelson was selected at the beginning of the second. All three disappointed for a variety of reasons. And even though Julio Jones and A.J. Green finished last season as Top-10 wide receivers, they still failed to live up to their first-round ADP. Drafters are showing more willingness to trust running backs in the first round this season than in recent years. It also helps that we have seen an influx of multifaceted running backs in recent years, and offenses are trending away from the “three yards and a cloud of dust” running back. Of the nine running backs who rushed for at least 1,000 yards last season, six also added at least 400 receiving yards. Prior to last year, there hadn’t been as many as six backs to reach the 1,000/400 marks in a single season since 2010. This latest crop of do-it-all backs has upside that players are willing to target with their first picks. The first thing that really stood out to me when I started digging into this year’s ADP is that Aaron Rodgers is currently going around pick #32. It is the latest we have seen the first quarterback go off the board in at least a generation. In fact, in the last 20 years, in only one other season (2016) did we not see at least one quarterback selected in the top 20 fantasy draft picks. The main reason for this is that the quarterback position is not that quarterbacks are bad – quite the opposite, in fact. Quarterback is deeper than ever, and there is not a ton of separation amongst the top 10 or 12 quarterbacks. In one-QB leagues, there just isn’t a sense of urgency to draft an elite quarterback early. A quick note if I may highlight my point above about checking your Fantasy Football ADP sources – at ESPN, Rodgers’ ADP is 21. That’s nearly a full round of added value for the same exact player. The twelfth quarterback (presumably the last “starter-worthy” pick) is going in the tenth round. And there are several others whom you can draft even later who should provide excellent value this season. Ready to amp up your Fantasy Football prep even more? 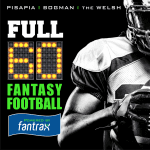 Check out Full 60 Fantasy Football, where Joe Pisapia, Scott Bogman, and The Welsh bring the goods every week. Um, no. At least not yet. We remember that the 2018 NFL Draft saw a record four quarterbacks taken in the first 10 picks, with several franchises pinning their long-term hopes to these rookies. However, you should not look to any of them for Fantasy greatness anytime soon. None are expected to start the 2018 season for their teams and can be safely avoided until further notice. The quarterback position is far too deep to stash a rookie in the hopes of him getting some playing time down the road. That’s what FAAB and waiver claims are for. While wideouts currently only occupy three of the first 12 picks in most drafts, seven wide receivers are being selected in the second round. There are no major surprises in this range, but there is value to be had even beyond Round 2. Doug Baldwin has finished two of the last three years as a Top-10 Fantasy receiver and is going in the third round. Amari Cooper and T.Y. Hilton finished 2016 as WR1’s before disappointing owners last year. Each could bounce back and be valuable in 2018. And Rounds 4-5 can be veritable gold mines. Brandin Cooks and Larry Fitzgerald were both Top-10 Fantasy receivers last year and can be had in the fourth round. Two of last year’s WR2’s (Jarvis Landry and Alshon Jeffery) can be had there as well. And of course, there are the wild cards – Josh Gordon and Allen Robinson. Each carries some risk, but also has elite upside, having already registered Top-5 Fantasy seasons. Round 5 boasts some intriguing options as well. Two more WR2’s from 2017 can be had here, and both of them (Juju Smith Schuster and Demaryius Thomas) can improve on last year’s numbers. We also have last season’s overall WR4 in Marvin Jones. Jones is being given no respect in drafts to this point. While a repeat of last season’s success is unlikely, he can still be a nice value here, as is the case for teammate Golden Tate. Throughout the years, many of us have gone back and forth debating the merits of a Zero-RB and/or Zero-WR strategy. Of course, both are valid, and neither is without flaw. The main draw of either strategy was to get elite players at three of the four main offensive positions. However, this year, there are just two quarterbacks and three tight ends going in the first 50 picks of most Fantrax drafts. Fantasy owners are instead trying to grab the best running backs AND receivers available. Based on Fantasy Football ADP, 22 running backs and 21 wide receivers are being selected in the first four rounds of 12-team drafts. This means that in many cases, teams are taking two running backs AND two wide receivers in the first four rounds. This is a far cry from the Zero-RB and Zero-WR strategies that have been so prevalent recently. That is not to say that a Zero strategy is a poor one. If utilized properly, such a plan can be quite beneficial, especially in a game which tends to favor those who zig when others zag. I am quite interested to see how these strategies will work out in 2018. 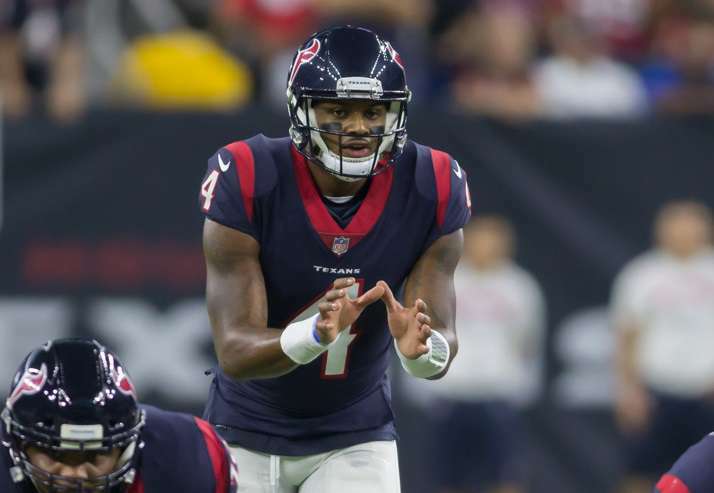 Fantasy players seemingly saw enough of Deshaun Watson’s potential in limited action last season to anoint him as Fantasy’s next star. The second-year quarterback out of Clemson is going second among quarterbacks in drafts, with an ADP of 47 here at Fantrax. DeAndre Hopkins is also going second at his position, though that is not a surprise after leading all wide receivers in Fantasy points last season. Whereas Hopkins proved successful regardless of who the Texans had under center, the same could not be said for his opposite number, Will Fuller. Fuller missed the first three games of the 2017 season after suffering a broken collarbone in training camp. He hit the ground running upon his return, catching seven touchdown passes in just four games alongside Watson. However, once Watson went down with a torn ACL, Fuller was virtually invisible throughout the rest of 2017. He is currently being selected as a WR3 toward the end of the seventh round. If he and Watson can pick up where they left off, this offense can be elite and Fuller will have massive upside. You’re doing all the prep, now head on over to Fantrax to start or join a Fantasy Football league. At Fantrax you can draft a team 364 days a year… Sorry, we had to give the IT guy one day off. You would think that with quarterbacks being devalued to some extent, that the ranks at other positions would be thinned out by the middle rounds, but that is really not the case. As more NFL offenses incorporate multiple running backs and diverse passing attacks, there are still plenty of players who can be had well into your draft who are viable fantasy options. Potential starting running backs Jamaal Williams, Marlon Mack, and Isaiah Crowell can all be had in Round 8, as can rookies Royce Freeman, Nick Chubb, and Kerryon Johnson. PPR specialists Tarik Cohen, Chris Thompson, and Duke Johnson can all be had in Rounds 7-9. Plenty of wide receivers can be had as well in this range. Chris Hogan can still be had in Round 8, though I expect that to change now that Julian Edelman’s suspension has been upheld. Robby Anderson, Kelvin Benjamin, and Allen Hurns are decent bets to lead their respective teams in receiving and can all be had after pick 100. This is why I generally gravitate towards taking defenses late. There are so many solid players you can fill out your roster with who can provide incredible bang for your proverbial buck in the middle and later rounds. Many of these players are likely to see a spike or decrease in ADP as positional battles are won and lost prior to the season. These are the kinds of things to keep an eye on as training camp and the preseason progress. I am looking forward to seeing how Fantasy Football ADP trends shake loose over the course of the next several weeks. Continue your prep for the coming season and dig into our 2108 Fantasy Football Draft Kit. New content is added daily and we’ll keep everything updated to help you get ready for opening kick-off.